This is a slideshow presentation about German "Lebensmittel". Using some pictures it shows foods like meats, fruits, dairy products, beverages etc. all listed in German. 11 Slides total. 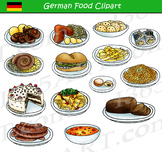 These resources practise understanding vocabulary related to food and drink in German and focuses on a popular speciality. This is a written assessment in English intended for Level 1 students in a comparison of food culture between the United States and Germany. This worksheet is meant to partner with the Slow German podcast "Essen" by Annik Rubens. It discusses food trends, restaurant culture, and cooking shows. This cultural comparison worksheet is meant to go with the YouTube video series "Germany vs. USA" It is intended to facilitate discussion based on the differences in our food cultures. 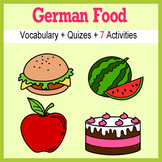 This resource practises using language to describe food and drink in German. Rules and cards for Go Fish card game with German food vocabulary. A4 sheet of small revision cards with a picture of a food and the German word. 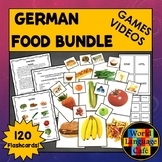 This resource introduces and practises a range of German specialities.